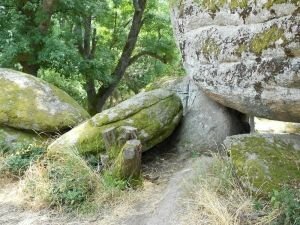 Begliktash, also known as Beglik Tash, is a megalith Thracian sanctuary, which was discovered in 2003. 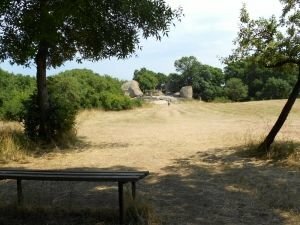 It is located near the ruins of the ancient city Ranuli near the Reserve Ropotamo. It is located three km. from Primorsko. This is the sanctuary of Ranuli. It is a circle of huge stones, which are in the middle of a meadow. It was a sort of ancient temple where they sacrificed gifts to the gods. Over time, there was housing built for the priests. The arrangement of stones is such that they form an observatory, which acts as a calendar, clock, and temple. The temple has an altar carved into the rock, which consists of two tanks, connected by chutes. The temple has an altar and a stone throne on which a priest sat. In the altar were found only traces of plants because obviously there were no animals sacrificed, but different species plants. The stones have holes carved that let in the solstice sun to illuminate these points. The stones functioned as a clock. The sunlight that falls from the main altar, divided the day into six equal parts. It is believed that Begliktash sanctuary is made in the fourteenth century BC and continued to operate until the fifth century after Christ. This place was attractive to the Thracians, Romans and Greeks in different epochs of its life. It is believed that Begliktash has served the needs of the cult of the sun god of the Thracians. There is also a view that some of the rituals performed in Begliktash are characteristic of the cult of the Mother Goddess. 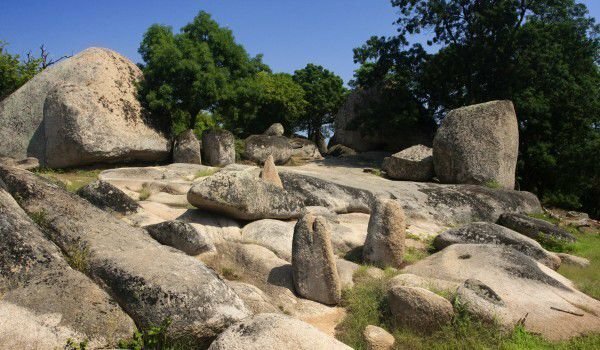 It is also believed that on the rock bed gathered for rituals the Union High Priest and supreme Priestess. The baths, which are located around the bed, served to fill with water, oil, milk and wine. Wine symbolized the earth, oil symbolized fire, milk symbolized air and so they gathered the four elements. In particular, after rain water is collected in the carved grooves and if you look at the top, the solar water has formed characters. Above the throne of the High Priest was a wooden shed. The most interesting stone in the complex Begliktash is called the Apostle tash. It is huge, and relies only on two points. 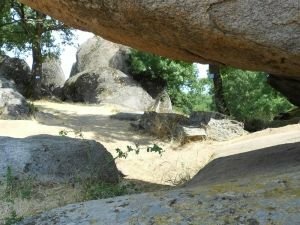 It is believed that between the base and the stone was a volcanic layer that was removed with tools by the inhabitants of this place and so the upper stone is fixed to the bottom on only two points. The ancient sundial, which will one day be rebuilt, fell, because in less than one hundred years the highest stone fell and destroyed the rest. By the sundial is located a Labyrinth - there young men chose their lives. Those who choose the right way, were directed to a practical craft, and those who choose the left path, became priests. One of the most interesting tests is a narrow rock crevice, through which only the righteous could pass. Begliktash has dolmen which is used only for ceremonial purposes. Its shape symbolizes the female womb.